For information on the general process for becoming a member of the Auburn University Marching Band Tiger Eyes, please visit the Join the AUMB page. 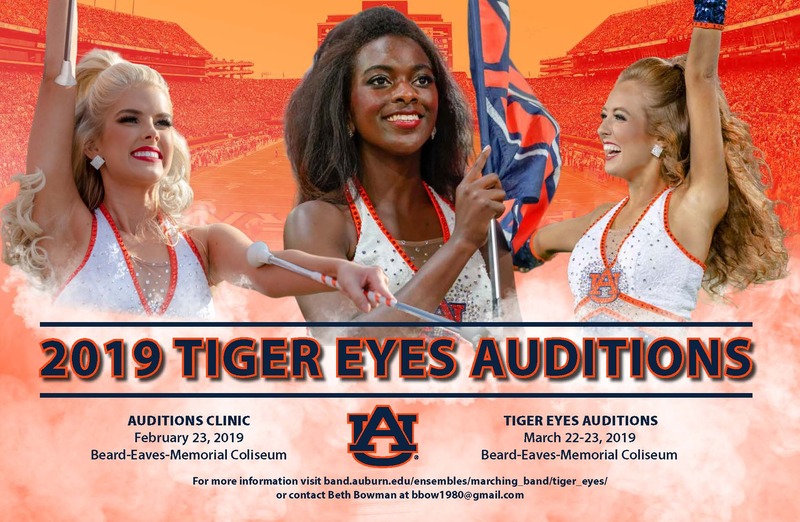 The Tiger Eyes Instructors will hold an Audition Clinic on Saturday, February 23, 2019 at Beard-Eaves Memorial Coliseum. This clinic is not mandatory, but attendance is strongly encouraged. The Audition Clinic will be structured so that candidates can participate in Majorette or Dance Line clinic and the Flag Line clinic. All candidates must be accepted to Auburn prior to the audition. If a candidate has not applied, they should do so immediately. Applications can be completed online at http://www.auburn.edu/admissions. Note that candidates' admission to Auburn University will be verified prior to the audition. A candidate who is a current Auburn University student must have an overall GPA of 2.0 or greater. All candidates should be aware that Mini Camp will be held May 31 - June 2, 2019. All parts of Mini camp and band camp (July) are mandatory should a candidate be chosen as part of the 2019-2020 Tiger Eyes. Auditions for all three lines will be held March 22 and 23, 2018 at the Beard-Eaves Memorial Coliseum on the Auburn University campus. Candidates are encouraged to audition for two lines to better their chance of being a part of the Tiger Eyes. Candidates have the option to audition for all three lines and will be asked to rank their first, second, and third choice (if applicable) in case they make more than one line. Candidates do not need to rank their order of preference if only auditioning for one line. Results will be posted within 24 hours of the actual auditions. 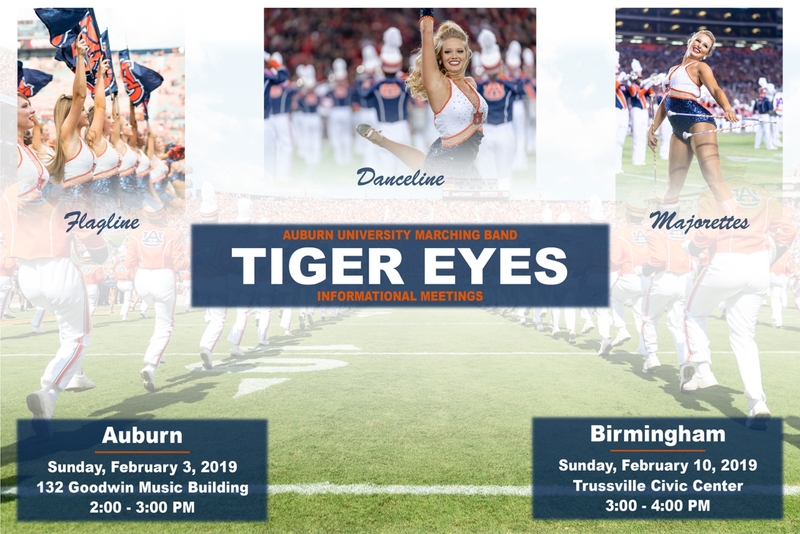 Any questions or concerns about the audition and/or clinic dates, times, or procedures should be directed to Beth Bowman, Tiger Eyes Coordinator, at (229) 630-0818 or bbow1980@gmail.com. Performance of Individual Routines 12:00 p.m. Seating will begin at 11:45 a.m. Performance of individual Routines 1:45 p.m. Seating will begin at 11:45 a.m. and will be open for seating again after the Danceline solos have concluded at 1:30 p.m. There is an admission fee of $5 per person per event. For those attending both the Dance Line and Flagline solos, the admission fee is $10 per person. Candidates will be taught a brief routine at the audition, which will be performed in small groups. Candidates will be judged on their ability to learn choreography quickly, ability to memorize/retain, overall ability to perform in a group, technique and execution, and overall performance and showmanship. Majorette candidates should include at least 45 seconds of one baton and at least 15 seconds of two baton twirling. Candidates will have the option of twirling 3 batons for a maximum of 30 seconds. You are not permitted to use more than 3 batons, or batons connected to anything (i.e. flags, streamers, hoops, glowsticks, etc. ). Majorette and Flagline candidates are encouraged to incorporate footwork into their routine while working with their respective equipment. Danceline candidates are encouraged to demonstrate their talent, knowledge of dance, and personality, and best style of dance while considering the "performance style" of the Tiger Eyes Danceline. All candidates should remember that there will be no props, 4+ batons/flags, hoops, streamers, knives, rifles, sabers, or other novelties permitted in this audition. Candidates for all three lines should consider that their routine will be judged on difficulty, technique and execution, "crowd appeal," effective interpretation of the music selection, and overall performance and showmanship. All music used for the individual routine should be considered "family friendly" and should not contain any offensive language, demeaning themes, or contain suggestive lyrics. Basic technique and travel fundamentals will be demonstrated in brief combinations consisting of the elements listed below. Candidates will be judged on overall skill proficiency, execution, and body placement/control. To view a video of each combination, click on the combination you want to see. The combinations will also be reviewed at the Audition Clinic (see "Audition Clinic" above). Audition attire for all three lines is as follows: black leotards (style optional), flesh-colored tights, and jazz shoes or dance sneakers. No boots or character shoes may be worn. “Hot shorts,” not Soffle shorts or any other athletic shorts, may be worn during the individual routine portion of the auditions only. They may not be worn at any other time before or after the individual routine performance. Hair, make-up, and accessories should be worn as the candidate feels is most appropriate for a performance with the Tiger Eyes. For the Audition Clinic, candidates should wear appropriate, comfortable clothing and suitable footwear (e.g. jazz shoes, dance sneakers, tennis shoes). Majorette and Flag Line candidates should bring their own batons or flag poles. For individual routines, each candidate should choose their own music and provide a CD (no cassette tapes) at the audition registration. Please test CDs on a standard Compact Disc player. The audition music should be the only track on the CD and should be ready to start at the beginning to avoid delays to the auditions. A backup CD is suggested. If a candidate’s music does not work for any reason, the candidate must continue performing. Do not ask to start over. The performance of Individual Routines for all three lines will be open to the public for a small fee. Children ages 5 and under will be admitted free of charge. Regular admission is $5. Family members, friends, and members of the community are encouraged to attend. Performance times for Individual Routines are stated above (see "Audition Dates/Times"). The Individual Routine is the only component of the audition that will be open to the public. Only candidates, judges, and AUMB personnel will be admitted into the audition room for the remainder of the audition process. NO PHOTOGRAPHY OR VIDEOTAPING IS PERMITTED. Any violation of this rule will result in the audience member's dismissal from the audition room. Your cooperation is appreciated.